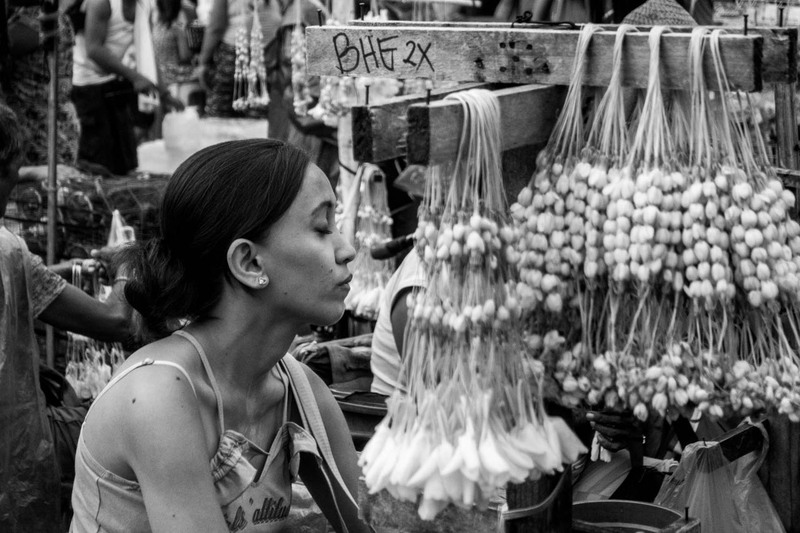 A sampaguita vendor takes a moment to relish the sweet, thick fragrance of the fresh flowers that she sells at the plaza right outside of the Minor Basilica of the Black Nazarene in Quiapo, Manila. I took the plunge and downgraded my gear from full frame to 1-inch sensor. A few months ago, I sold my Sony A7SII and now I’ve taken in this Sony RX100V, a very tiny compact camera that has a lot of potential for what I do. I took this tiny and very stealthy camera for a spin, taking photos in and around Quiapo and Sta. Cruz, Manila yesterday late afternoon. Now I am down to this RX100 and my Sony A6000 as my only digital cameras (besides my smartphone), but I am soon also selling the A6000. I enjoy not having to carry too much and since this camera is so small, I can literally put this inside my shirt pocket, walk everywhere and take pictures without catching much attention. BTW, this photo is also my submission to LensCulture’s Street Photography Awards 2017. Filed under Street Photography. Tagged as Black and white, Compact Cameras, Manila, Point & Shoot Cameras, Quiapo, Sony, Sony RX100V, Street Photography, Streets of Manila.